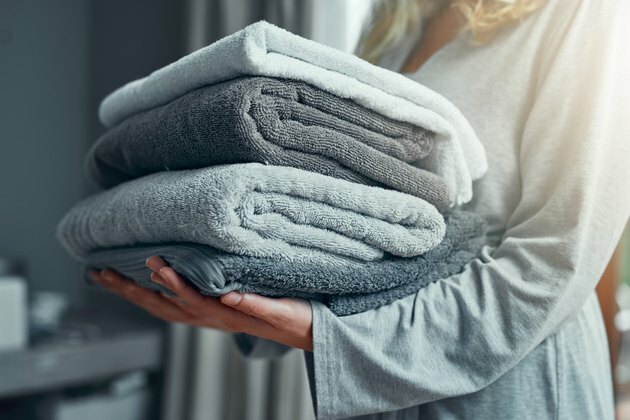 Whether you've just purchased new towels or have had a set for many years, you may be wondering how to freshen and soften your linens for a superior drying experience. Fortunately, household staples like baking soda and vinegar are all it takes to prevent shedding, increase absorbency and soften your towels. Maintaining your towels regularly via these simple methods can help greatly extend their life. When you have brand new towels, they are often extremely fluffy. However, some of this excess fluff can come off after some time, which leads to an unfortunate shedding process that leaves you feeling less than clean. To prevent towels from shedding, there are a few steps you can take before you put them to use. One method to preventing towels from molting is to first wash them in a load of hot water and one cup of white vinegar. You should use laundry detergent in addition to the vinegar. In many cases, this trick will stop towels from shedding when you next use them. Another option to prevent towels from shedding is to first wash them in hot water and 1/2 cup of baking soda. It's best to dissolve the baking soda in water before you add it to the wash. Include your usual amount of laundry detergent in this wash, as well. If your towels are no longer absorbing water when you attempt to use them for drying, a simple fix can have them back to normal in no time. Try washing your towels in a hot wash with 1/4 cup of white vinegar. You can use your regular detergent, as well. Over time, fabric softener can build up on towels and lead to this absorbency issue. In addition, new towels may not soak up water as well as you'd like because they come treated with chemicals. There are a number of approaches you can taken when softening your towels. You can try cutting back on detergent, as a build-up of soap over time may make your linens stiff. Whenever possible, wash your towels in warm water, as it absorbs detergent better. This means less soap residue left behind on your linens. Once every six weeks, try using one cup of white vinegar in your wash to soften your towels. The vinegar helps to fight through the build-up of detergent and fabric softener and leaves you with fluffier towels. You can also use ½ cup of baking soda with your normal laundry detergent. Baking soda helps to loosen the fibers of your towels and can clean off chemicals or dirt. Even better, using baking soda with your towels helps to eliminate odors. If you accidentally left wet beach towels in a heap at the bottom of the laundry pile, washing them with baking soda can help to rid them of their musty smell. Don't overcrowd your washing machine, especially when you wash towels. Doing so can make it hard for the appliance to properly rinse out all of the dirt and detergent, both of which can reduce the softness of towels over time. When you dry your towels, use a low heat setting, and throw in a clean, unused tennis ball to help soften and fluff linens.